Hello and welcome to the Your Next Stamp February new release blog hop. I am so honoured to be a part of this exciting release of new stamps and dies. I have created several projects already and I can't wait to share them all with you. I created a card that is perfect for the sports fan on your card-giving list!! 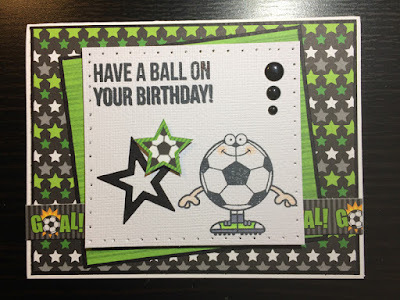 I used the Sports Fanatics Two stamp set. To celebrate this month's release, Karen has a great promotion for you! Thanks for hopping along with us today. Remember to leave a comment on each of the blogs as you go. There is a fabulous prize available up for grabs ($25 YNS gift certificate). All of the blogs are listed below. The hop continues until February 9th (EST) at midnight. I totaly agree with you...a super card for a soccer-fan or voetbal-fan as we say here in Holland. Like the whole look of your card. Super fun and cute card! Really cute! 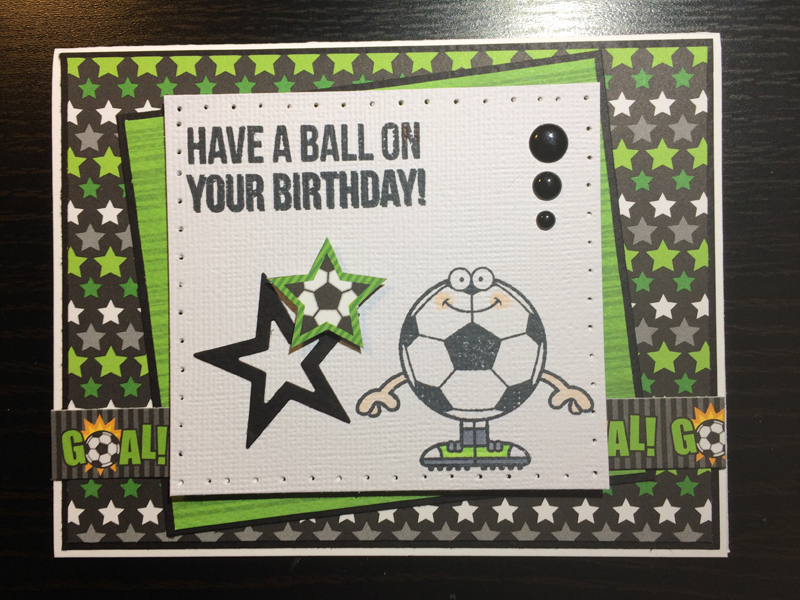 Any sporty kid would love to receive that card! Very cute! I like all your layers and the green and black colorway is perfect! Perfect for a sports fan. I like the papers and the stars. Love the colors you chose! Great card! What a cute card. Love the soccer ball. Thanks for the inspiration. What's more fun than animating a soccer ball?!! the card really shows off the sports theme. The colors are great and the designs on the paper really fit the idea. Cute card! Such a fun image! Great for sports theme! What a perfect stamp set for all those sports-loving fans! Love the fun colors of your card! Super fun and festive! Perfect stamp for soccer players & those who sponsor soccer teams! Carolyn this is such a cute card! I have to get this set for my nephew's next birthday card! Great card and love this set - need it!!! This card would be perfect for a boy...I love it! So fun! Looks great with all the green! Oh wow! Lovely card!!! Super cute!!!! Such a bright and absolutely fun card! Love the green and black stars background! Have a couple of soccer players in our family so this is great inspiration for a card for them. Love the sports themed sets--perfect for my hubbie! Great image for all our Sports Fanatics out there! Oh I LOVE it! What a great guy card! So FUN! Such a cute, sporty card. Need this for my daughter. She loves soccer! Your card scores a goal! Have a BEE-utiful day! So cute!! This area is really big on soccer, I know so many people I could use this image/sentiment for! Love your layout and papers. Super cute card!! Love sports themed stamp sets!! Your Next Stamp Sneak Peek!! Your Next Stamp Guest Designer! !